> Admissions > Why St. John’s? A superior educational setting for students grades PreK-8. A solid moral foundation, with an emphasis on integrity, responsibility and respect for self and others. A caring, faith-filled atmosphere, where students grow a relationship with Jesus Christ. Individualized attention (class size is capped at 25 students per class). A vibrant, dedicated and award-winning teaching staff. A community wherein each student is personally known and encouraged to utilize his or her own unique gifts to achieve their best. Become disciples of Jesus Christ. Discover and live up to their full potential. Develop responsibility and respect for self and others with a sense of gratitude. Grow into strong, hardworking youth with a trust in and love for God. Express their values through Christ-like service to the community. The curriculum at St. John the Baptist is continually reviewed to assure the best teaching tools for our students. 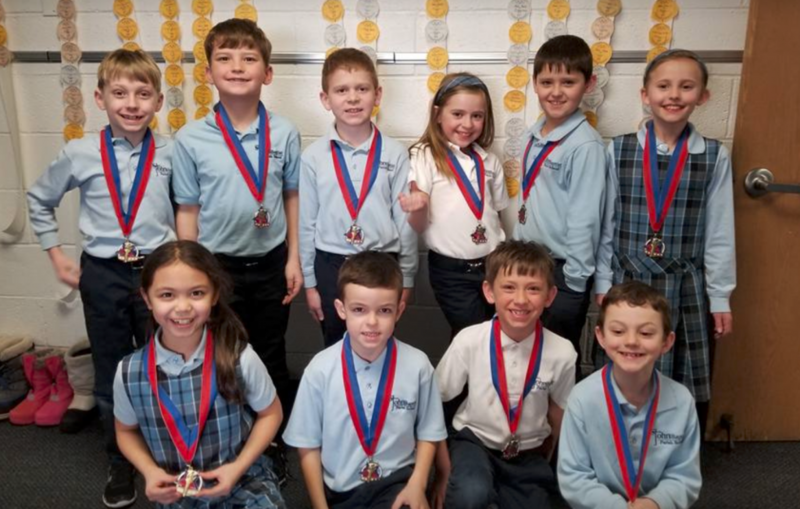 We are proud to have been recognized with hands-on science experimentation (multiple SJB students have reached the annual Top 10 in the National Discovery/3M Science Student Competition held in Washington D.C.). Spanish – Focusing on language/communication basics and cultural appreciation. Music – Band and choir options. Art History – Offering pottery, cartooning, marketing awareness and award-winning stained and fused glass work. Technology – Including internet literacy/safety awareness components. Integrated coursework – Various subject areas coordinating together on certain assignments. Bullying Prevention program – Increases student empathy and fosters greater staff-student connections via weekly smaller group sessions. “Faithful Beginnings” Preschool – ages 3-5. At St. John’s, we consider every student’s learning to be imperative, and our administration and staff work closely with families to meet student needs. This is why we have an on-site Student Resource Administrator who works with teachers and students to accommodate for varying learning needs and offer special assistance options. In addition, an on-site counselor is available to meet with students as requested, along with access to a child psychologist. Weekly all-school mass, including student participation in various ministries. Daily all-school and classroom prayer. Teaching masses (whereby students learn the meaning/significance of the words, actions, vestments, etc. of the Mass, along with Q. & A. time). Religious presentations throughout the year. Multiple service/outreach projects involving the wider community (nursing homes, military personnel, local food shelves, etc.). 8th grade vocation field trips. Prayer Partners program pairs younger students with older mentor students. Extra-curricular opportunities including student government, scouting, drama, chess club and championship Jaguar sports teams. A Parent/Teacher Organization and School Principal’s Advisory Committee. Moms in Touch prayer group which prays for each student and staff member by name, as well as for any/all anonymous prayer requests. The J-Care program, offered for SJB students grades K-8 – a fun, flexible, affordable, non-contract before-and-after school (& summer) care option, and our Faithful Beginnings Preschool Extended Care. Volunteer opportunities that enable families to get to know one another and share their gifts and talents. Multiple community events throughout each school year. We invite you to join us for an event and speak with some of our families.